What is an electron? What is an electromagnetic field? The geometrical interpretation of these notions is suggested and this can be considered as a step to the establishing of geometrical paradigm in physics where all matter is nothing more than spatial deformations. The modern paradigm goes back to Democritus andconsiders two entities as the basic ones---empty space and all the rest inserted in this space. The Einstein’s theory of general relativity described gravitational field as a curved space and thus stimulated investigations of geometricalparadigm where all mater can be considered as different deformations of one entity---the space. At first main efforts were directed to finding the geometrical meaning of electromagnetic field but there were no attempts to geometrize quantum elementary particles. hyperboloid (Fig.B). 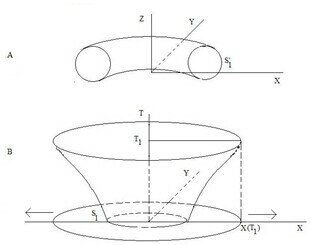 Cross-sections of this hyperboloid by planes parallel to XY-plane taken for different values of time describe the movement of expanding circle in this plane. The habitants of the one dimensional world could only detect the points of intersection X(T) of expanding circle with their world and they will interpret these points as moving quantum particle. As for the circle itself, it will be considered as a defect of the “physical” one dimensional Euclidean space situated in external two dimensional space. In our 3-dimensional space an electron appears to be a moving microscopic region of this space where Euclidean geometry is distorted and this region is theintersection with the spatial defect situated in the external space. The fact that an electron can be represented as a part of some geometrical object moving in the external space leads to an idea that an electromagnetic field should bealso represented as a geometrical object with the space dimensionality more than three. Dr.Olkhov suggested that electric and magnetic fields can be represented by different components of torsion tensor of closed 5-dimernsional space where usual space-time is a 4-dimensional subspace. This space is closed in fifth direction and extends in this directions to microscopic distance. Such representation gives an opportunity to avoid disadvantages of former theories. At the right Figure this space is represented using again a low-dimensional analogy. For inhabitants of the one-dimensional Euclidean world this space at every moment of time is a two-dimensional closed surface. Here this surface is represented schematically as a cylinder with varying radius. One-dimensional Euclidean “physical” world is a straight generatrix of the cylinder. 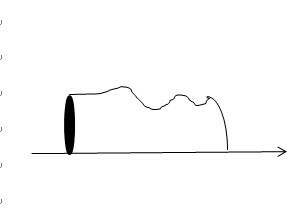 The one-dimensional inhabitants feel the electromagnetic field as the different curvature of this cylinder at points of their one-dimensional Euclidean world. Here we use curvature (not torsion) because it is impossible to demonstrate torsion on plane Figure.